I have really enjoyed my short time here on WP and have come across some awesome blogs. I have received a few messages lately letting me know I have been nominated for a few awards. Thank you, I am very humbled! Please visit and say hello to the sweet bloggers who nominated me, you won’t be disappointed! 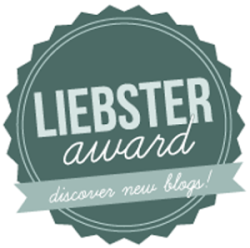 Have nominated me for the Liebster Award. 1) How has your childhood affected you?–It has shown me that with God nothing is broken. 2) If you went back in time, is there one particular thing you would do differently?- It has all made me who I am. So I don’t think I would change a thing. 3) Is there any particular experience that has made a significant impact on your life? Being a teenage mama of a micro-preemie. 4) If there was one thing you could do to make the world a better place, what would it be? End abuse and famine. 5) What are the three most important things in your life? Jesus, Husband, and my chidren. 6) What characteristic do you admire most in a person? Honesty and kindness. 7) Is there anything you feel people don’t know about you that you wished they knew? Hmmmm…..
8) What’s your favourite pastime? Bargain hunting and just spending time with my loves. 9) If you had a chance to dine with three famous people, dead or alive, who would they be and what would you say to them? Jesus, Pontius Pilate, and John the Baptist. 10) Do you have a favourite quote? If so, what does it state? I have many but this one comes to mind-“Integrity is doing the right thing, even when no one is watching.” ~C.S. Lewis. and the sweet gal over at http://kristenzuray.wordpress.com/ asked these questions. 1.) What prayer has God answered recently? School bussing for my oldest daughter. I love that God cares about even the smallest of details! 2.) How do you wish God will use you? I have always admired missionaries who serve abroad, but God has me content where I am. 4.) What is something fun you like to do? Bargain hunting and spending time with my family. If you so chose to accept here are my questions for you. 2. Favorite place you’ve ever visited. 4. Who do you most admire? Why thank you – yes I accept your nomination. 1. Phil 4:13 “I Can Do All Things Through Christ Who Strengthens Me. 3. Interesting question; as a non believer I had a ton, but since then very few as it’s hard to find a good movie that is morally acceptable these days. 4. Besides Jesus, John C. Maxwell. His insight and leadership is amazing. Congrats! Keep on posting and I love that you love the Lord and your family! Thank you for the award! That means so much! I will def. get on that in the next week or so ( it is back to school teaching on Monday for me!) Loved your answers…CS Lewis is my FAVORITE! And I love bargain-hunting…yard-saling is my favorite, too! Thank you so much for the nomination! I will be giving some thought to my own post. 🙂 Congrats to you on the award–your blog is a pleasure to read. Blessings to you.